After application by a certified contractor, a proprietary blend of minerals, interlocking fibres and speciality binders adhere GeoSpray to the substrate, forming a tough, resilient and flexible cover. This durable cover can move with the ground below, minimising cracking. 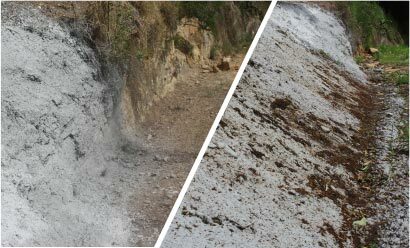 Because GeoSpray can be applied using hydroseeding equipment, our GeoSpray contractors are able to access difficult-to-reach places. 1237P – regarding geobinders (non-toxic material or substance sprayed on to soils to prevent erosion). 1345P – regarding erosion control blanket (products reduce impact of raindrops and low-velocity flow). Independent Analyst Druce Batstone B.Sc. (APP), B.E., PHD.